LOCHEARNHEAD, England - Nov. 24, 2016 - PRLog -- BLiSS art sculptures and installations were linked together on a trail that is designed to encourage visitors to smile, stop and spend time in Balquhidder, Lochearnhead, Strathyre and St Fillans villages - whose capital letters make up the word BLiSS, including i to represent the international tourist information symbol. LETi destination management group launched the award winning art and architectural installation trail to celebrate Visit Scotland's tourism theme "Year of Innovation, Architecture and Design 2016". Chair Kim Proven accepted the award winners trophy - sponsored by Edinburgh Airport Limited - from STV presenter and former Miss Scotland, Jennifer Reoch. Kim said, "We are delighted to receive this award recognising our achievements in Working Together For Tourism. LETi has proved that a small group can carry out an effective tourism campaign on a shoestring through local peoples' skills, energy and enthusiasm. A huge thank you to our friends and collaborators, especially the artists and architects who lent us their time and twenty five magnificent and fun sculptures and architectural installations. And to the Villagers of Balquhidder, Lochearnhead, Strathyre and St Fillans who embraced #BLiSStrail 2016 and continue to support it." 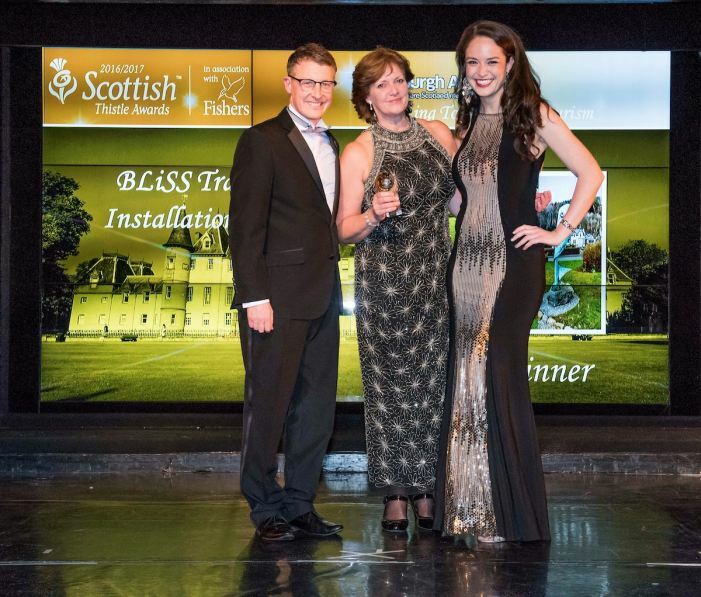 LETi won the Central, Fife and Tayside regional awards and will now take BLiSS trail on to the national finals at the Edinburgh International Conference Centre on March 16th 2017.